Paleontology has helped us understand the unique evolutionary history of birds. 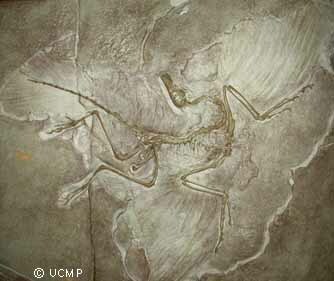 Cast of the Berlin specimen of Archaeopteryx lithographica, from the collections of UCMP. Original at Humboldt University, Berlin. As you can see, Archaeopteryx certainly had feathers, although whether these feathers were used for regulating its body temperature or for flight is a matter still open for debate. Feathers may have originally evolved for insulation and then been co-opted into flight. The origin of flight, and the actual flight capabilities of Archaeopteryx, are debated. Two models of the evolution of flight have been proposed: in the "trees-down" model, birds evolved from ancestors that lived in trees and could glide down, analogous to today's flying squirrels. In the "ground-up" model, the ancestors of birds lived on the ground and made long leaps. For more information, see our new exhibits on vertebrate flight and avian flight. The flight stroke may have originated as an extension of the grabbing forearm motions that smaller, agile theropods such as Deinonychus may have used to grab and hang on to prey. As you know if you've ever cut up a chicken, living birds (except for flightless birds like the ostrich and kiwi) have a keeled sternum to which the large, powerful flight muscles attach. Archaeopteryx, however, had a comparatively flat sternum. Although it is currently thought that Archaeopteryx could sustain powered flight, it was probably not a strong flier; it may well have ran, leaped, glided, and flapped all in the same day. Some years ago, the British astronomer Sir Frederick Hoyle and colleagues proposed that Archaeopteryx was a clever forgery. Check out Archaeopteryx -- Is This Bird A Fraud?, an excellent essay that not only reviews the evidence for and against fraud, but assesses various theories of how this creature lived.